Community leaders gathered to consider retail options after Hurricane Harvey knocked out stores in southwest Houston. HOUSTON – (By Michelle Leigh Smith) – The H-E-B grocery near the banks of Brays Bayou in Southwest Houston flooded again during Hurricane Harvey. This came after heavy flooding on Memorial Day in 2015. Finally, H-E-B announced last week it will close the store permanently, rather than repair and remodel yet again. The news came as no surprise to regular customers. But that doesn’t mean they are happy about it. “Glad they finally officially announced what we already kind of knew,” says Susan Speert, a teacher in a nearby public school. The store, which opened in 1992 in a retail center at Chimney Rock and 5417 S. Braeswood, was an H-E-B Pantry store – a 19,000 SF genre of retail that the grocer adopted at the time. The storm made landfall Aug. 25. After Hurricane Harvey’s flood waters receded, HEB hosted a community gathering at Godwin Community Center to share the bad news. 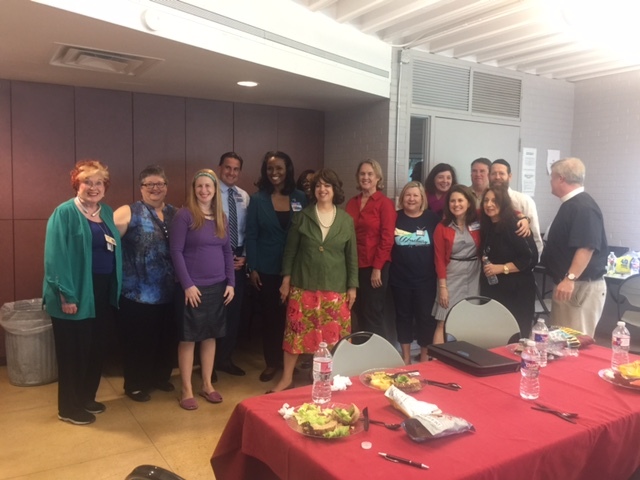 Leaders from the Greater Meyerland Super Neighborhood, the Westbury Super Neighborhood, St. Thomas Episcopal, the Evelyn Rubenstein JCC and Jewish Family Services and representatives from Houston City Councilman Larry Green’s office were invited. “I am personally sad to see this much-loved neighborhood store close,” says Becky Edmondson, president of the Westbury Civic Club. The store also had served the nearby Jewish Community Center. “We really miss our neighborhood H-E-B on Chimney Rock – we have a weekly lunch for our seniors at the JCC and H-E-B often brought dozens of roses for our seniors and food from the kosher section for senior luncheons,” says Michelle Groogan, spokesperson for the JCC. H-E-B grocery has been mentioned as a possible tenant at Meyerland Plaza, the 950,000-SF power center at the southwest corner of Beechnut and Loop 610, people in the real estate community say. A Meyerland Plaza store could fill a growing gap in H-E-B’s coverage in southwest Houston. Meyerland Plaza, operated by Fidelis Realty, has a 200,000-SF J.C. Penney and various pad sites and big box retailers. Several Meyerland Plaza stores took on water during Hurricane Harvey. Looking at its southwest Houston coverage, H-E-B currently has a store just north of West University Place at Buffalo Speedway. But otherwise, it has no other operating H-E-B store in the southwest closer than Highway 6 in Missouri City, over 10 miles away. A new two-story H-E-B is under construction near the intersection of Bissonnet and South Rice in Bellaire. But it will be another year before that store is open. It will be the first two-story H-E-B. Meanwhile, H-E-B customers must look for other options. San Antonio-based H-E-B, with annual sales of more than $23 billion, operates more than 380 stores in Texas and Mexico.